Eat It! Snacks & Sweets Trivia..
Eat It! Snacks & Sweets Trivi.. Here's a trivia game you can really sink your teeth into! Test your taste buds with fun trivia questions about the foods you love to eat, from Chocolate & Candy to Snacks & Desserts. What kind of animal is Cheetos' mascot, Chester? How many fudge stripes are there on a Keebler Fudge Stripes Cookie - 3, 5, 6, or 7? When Americans scream for ice cream, what is their favorite topping? The answers - A Cheetah, 5, and Chocolate Syrup! 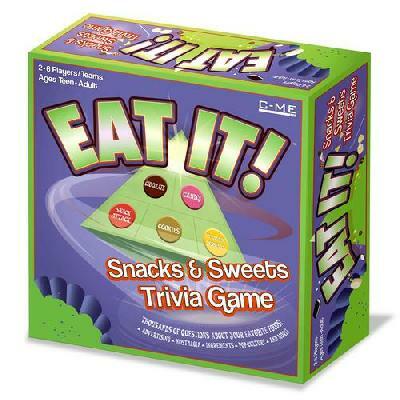 This fun and tasty trivia game redefines the food pyramid, with Snack Attack, Cookies, Ice Cream & Desserts, Candy and Chocolate categories occupying the spaces. Answer the questions correctly, make your way to the top of the Snacks & Sweets Pyramid, and you'll be the Snacks & Sweets Trivia Superstar! A newly added feature to this game are coupons (valued at approximately $6.50) for Jelly Belly jelly beans, Jolly Time Pop Corn, Cadbury Adams Swedish Fish and Sour Patch candies, Joseph's Lite Cookies, and Auntie Anne's soft pretzels! Game comes with Eat It! Game Board, 1 Box of 400 Eat It! Question & Answer Cards, 1 Set of 35 Eat It! Pyramid Cards, 1 Die, 6 Game Pieces, and Game Instructions. For 2 - 6 Players, Ages 13 and Up.